Significant changes to recycling programs have dominated headlines since early 2019. Whether the result of market conditions or global influences, they are changes we must all adapt to. They will affect all residential curbside programs and all business/commercial recycling programs IF your recyclables are currently being collected in a “single stream” system, that is all material mixed together in one recycling bin. For an in-depth analysis of this recycling upheaval, read the 2018 Fall By The Way. Many haulers are implementing the changes as their municipal contracts expire or roll over. If you have not yet been notified by your waste hauler, you will be eventually. The changes are being implemented immediately at the recycling processing plants, so even if you do not receive a notice of changes from your recycling hauler, material that is no longer collected in one municipality will probably not be recycled from your bin either. No Glass: Single Stream recycling is most often collected in a compactor truck. This results in smashed glass that not only mixes the colors but grinds shards of glass into the other materials. Glass containers only have value if they are color-separated, so the smashed glass can’t easily be recycled. It also contaminates the other material, making it worthless. No #3 through #7 plastic: Despite ongoing efforts, the recyclability of #3 through #7 plastic has not caught up with the volume being collected. Quite simply, there’s no market for it, so it most often gets landfilled anyway. #1 and #2 jugs and bottles only: #1 and #2 jugs and bottles have different properties than other #1 and #2 plastic tubs, cups and rigid plastics. They can’t be melted together to make new plastic items. Put recyclables loose in a recycling bin: Recycling processing plants do not have the ability to tear open plastic bags to remove recyclables. Doing so creates a safety hazard for employees, tangles up the moving parts of the equipment, and sacrifices efficient processing. Unfortunately that has become the new mantra for recycling programs. For as difficult as it is to say those words, it is far better to develop a robust recycling program with valuable recyclable materials than end up with a pile of trash that ends up in the landfill anyway just to make yourself feel better. REDUCE the amount of glass and plastics brought into your home; re-use when possible. New community-based glass collection programs will step up to meet the demand for container glass recycling but it will take some time. Bradish Glass near South Greensburg, 724-837-5100, accepts color-separated container glass, window glass, and other types of glass. Call for details. Recycle plastic bags at any grocery or other retail outlet. Dozens of websites contain timely tips and information on reducing and re-using everyday items and recycling right. Know the rules and find ways to adapt. Recycling is invaluable to conserving our planet’s natural resources, saving energy, and protecting our natural environment. It is a multi-billion dollar industry, employing 10s of thousands of workers. And, it’s still the law of the land. See Recycling 101 for a brief history of recycling law in Pennsylvania. 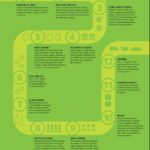 What can be recycled and where does it go? According to ACT 101 (Pennsylvania’s Municipal Waste Planning, Recycling, and Waste Reduction Act) all PA municipalities with more than 5,000 residents and more than 300 persons per square mile are required to make available curbside recycling service with leaf waste collection. These mandated municipalities can provide service through a hauler contract with the municipality, or through private subscription…which means every municipality in Westmoreland County can have a different recycling program. If you are confused as to what can be recycled within you municipality please check our Westmoreland Cleanways Recycling Guide, email us or call us at 724-879-4020. The majority of Westmoreland County curbside programs in which the municipality contracts with a specific hauler are single stream recycling programs. With Single Stream Recycling, it is no longer necessary to sort recyclables into a variety of bins. With this program ALL acceptable recyclables (plastics, paper, cardboard, cartons) are combined into one recycling container. As this program saves the homeowner both time and space, the program is easier to participate in than prior recycling programs. Due to the ease of this program, the solid waste industry believes more residents will recycle and more recyclables will be diverted from the landfills. According to Waste Management, single stream programs recycle on average 30% more recyclables than other recycling programs. If you’re not sure whether your community has single stream curbside recycling, take a look at our Recycling Guide call your municipal office, email us or call us at 724-879-4020. 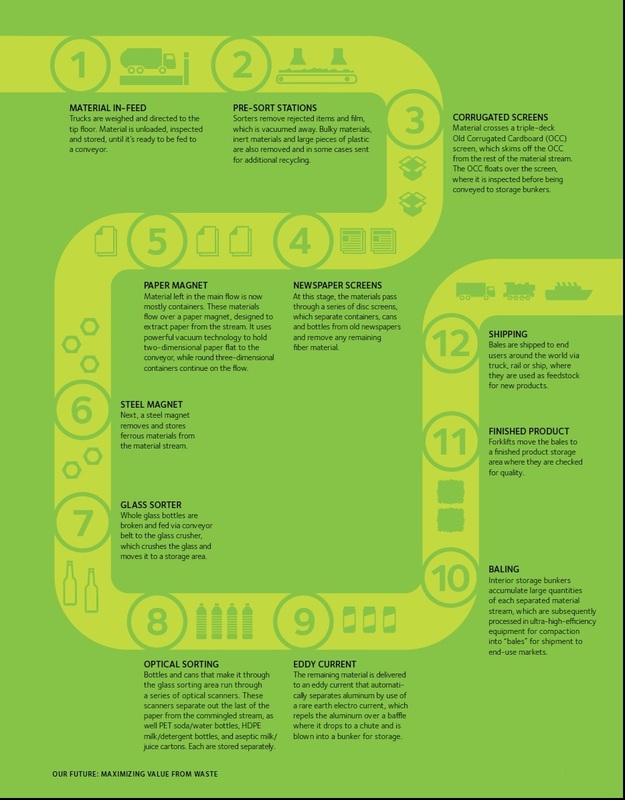 Click this image to view a high resolution diagram of the inner workings of an MRF. All municipal recyclables, whether collected curbside or drop-off, are ultimately transported to a Materials Recovery Facility (MRF) for sorting. In Westmoreland County, for example, many of the recyclables are transported to Waste Management Recycle America, located on Neville Island, and formerly known as Greenstar. These facilities process more than 10,000 tons of recyclables each month. Long gone are the days when recycling needed to be manually sorted before sending it off to the appropriate facility. In a state-of-the-art MRF, Single Stream Recycling is possible through advancements in technology as materials are processed and sorted using technology such as magnets, screens and optical scanners. Note: The aforementioned image is just one example. Depending on the location and the needs of the community, every MFR will have variations. 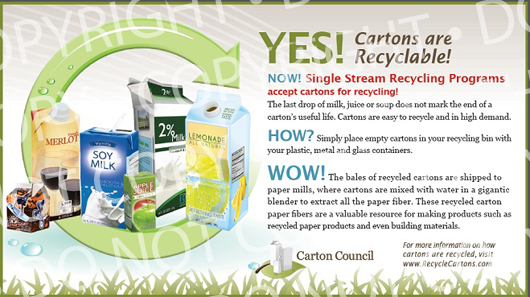 Cartons can now be recycled as part of most single stream programs. Cartons refer to aseptic containers, made from recyclable multi-layer plastic (polyethylene), paper and metal packaging that usually contain liquids such as milk, broth, soy milk, and juices. These containers can be found either on shelves or in the chilled areas of a grocery store. Carton recycling is on a roll! More and more U.S. households are gaining access to carton recycling all the time, including most households in Westmoreland County. Download our Frequently Asked Questions pertaining to carton recycling. For more information on carton recycling, visit the Carton Council. Contact Westmoreland Cleanways via email or call us at 724-879-4020 with questions pertaining to recycling cartons in Westmoreland County.